A gamechanger in the coffee machine industry, the Café Racer has a captivating design that was inspired by San Remo’s love for motorbikes and symbolises personalisation, freedom and character. Combining exceptional quality components, this machine is high tech and heavy duty, yet reliable, easy to handle, versatile and stylish – making it suitable for high volume workplaces that want to make a statement. Temperature precision and control comes from insulated stainless steel boilers, independent for pre-heating and brewing for each group. The high-flow rotary pump ensures optimal brewing pressure is always maintained, even with all groups operating together. Pressure, temperature and water levels are constantly monitored by high-precision electric sensors showing real time values and volumes on digital screens on the machine. This allows the barista to have pinpoint accuracy to make the perfect cup, every time. 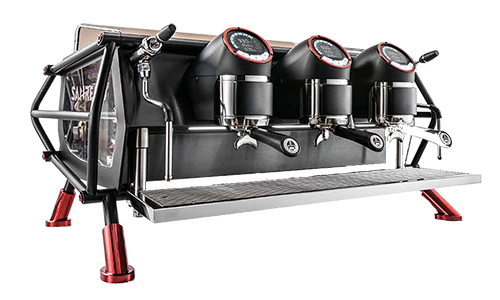 Hand-made in Italy, this machine is built just like a luxurious Italian motorcycle — for precision, speed and ease-of-use with pure stainless steel parts. Fast Coming in a range of colours and options, this machine is sure to impress anyone that sets their eyes on it. San Remo Café Racer not for you?